One of my favorite shows of all time was Mercyless in 2013 at Paris Metal France Festival. They covered Evil Dead, the circle pit was sick and I remembered why I love death metal. Mercyless, unlike so many of their peers have stayed true to the magic of death metal through thirty years and six albums. Pathetic Divinity showcases a band who speak to the might of a genre God spurned. The songs on this album remind us why the genre reigns supreme and proves time and time again that even in Trumps America death metal is magical. There is something wonderfully ominous about the albums introduction and the prevailing sense of evil reigns triumphant throughout. 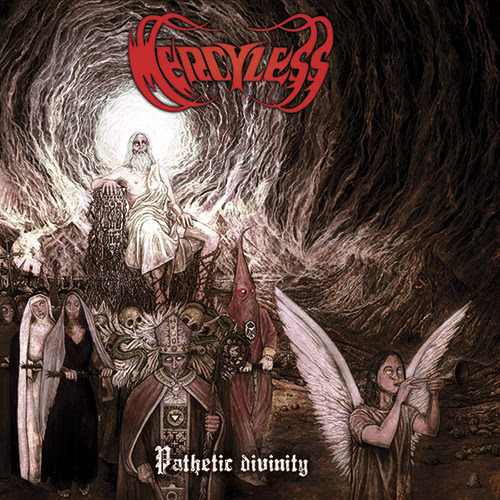 Mercyless are not a band who seek to find the light in the darkness, instead they want to plunge you deeper into hell. The hectic riffs, angular playing and spiraling madness that circles uncontrollably throughout Pathetic Divinity is strangely addictive. It's an album that is full of glorious evil, old school magic, but also production that hints at a far more modern edge. This is an album that gets to the spirit of death metal and cracks skulls, time and time again. It's hard not to love death metal that is this goddamn pure. In a world where so much death metal is boring or corrupted Mercyless have remained true for four decades, they speak to a world that makes us afraid, a reality that is, by default, twisted. A reality in which a madman like Donald Trump can take on the world. The world is a fucked up place and Mercyless know it. Pathetic Divinity is going to gleefully rip out your throat and prove time and time again that death metal will reign now and forever.